3 posts categorized "Current Affairs"
There are other things to look forward to in 2011 that do not have to do with books! I know that this is very surprising (it certainly shocked me), but it appears to be true. Everyone loves robots! One of the cool things that is happening in 2011 is that NASA is having a National Robotics Competition. I think that this is especially interesting because it's for kids. Working in comics I get to know a lot of artists, and they generally say things like, 'yes, I always drew ever since I was a kid.' Writers (not shockingly) report similar backstories for their writing. But who do you know who ever got a chance to build robots every day ever since they were three? I feel that we are possibly stunting a lot of robotics genuises by not giving them the tools early and consistently enough; maybe this'll help. I guess bifocals are not exactly new. But the internet told me about this version the other day; they're bifocals that don't have that bottom panel of glass but instead have a switch that you turn on or off depending which way you want to see! I have no idea how this works (except apparently with batteries), but nonetheless: super-cool. Thing #3: Privatized Space Travel! My knowledge of the inner workings of Virgin Galactic are slim to none (besides that all of their promotional pictures look like someone rendered them in CGI -- I can't tell if I'm having an uncanny valley moment or if their spaceships just look that weird), but in 2009, they said they're starting to take people to space in 2011, which is . . . NOW! I can't wait to see peoples' reactions to space, and whatever comes next -- privatized moon landings? Mars? Europa? A little drier than the last topic, but -- Calvin wrote this article for PW after this year's CES, which got me thinking about what I would do if I was going to college now and the college required me to have multiple forms of computers just to do the base level of attendance/participation. The best I could come up with was, 'beg my parents for money and hope it worked,' or alternative b, 'see about working thirty hours a week instead of twenty while simultaneously going to school.' Both options seemed less than optional (and not available to everyone). I hope this works out in a way where college education remains accessible to everyone, not just the upper middle class and up, and the few scholarship students. Apparently in 2011 movies are going to exist in 4-D! This is something the internet told me too, so I could very well be wrong about it, and it is technically wrong anyways, because the fourth dimension is time, and when you watch movies they exist in time by the very nature of their existance, and I suppose that the film reels and dvds and whatever automatically exist in time as well. Not being satisfied with making perfectly good movies have bits that pop out at you for no particular reason, the film industry has now decided that your films should be enhanced with things like smells and tastes and perhaps sprays of water! Clearly this will all end fascinatingly; I look forward to seeing how it works. Extra: The thing that I am looking forward to especially today (given that it is freezing and just post-snowstorming) is City Bakery's hot chocolate festival! Every February, City Bakery does a month of specialty hot chocolate flavors, with a new one every day. My favorite so far ever has been ginger (because I am a traditionalist when it comes to hot chocolate, apparently), but interesting ones of last year included a white hot chocolate and a beer hot chocolate! The last day they cycle through all the flavors and do a new hot chocolate every hour, or something completely crazy like that; it is highly recommended to all with New York City access. In conclusion: Any year is a good year when there are robots in it, and 2011 looks to at least live up to that. It makes me shudder to think what people did in the robotless years before 1495! Probably there was chaos. After a week of snowed-in-ness, we are back in the office and raring to go! There is nothing like Staring at Blank Whiteness, the Extended Edition to make one eager for the fun and excitement (and living color!) that is comics. Not that we wouldn't be excited anyways. Because: you guys, we have so much neat stuff coming up in 2011! It will be a most excellent year. 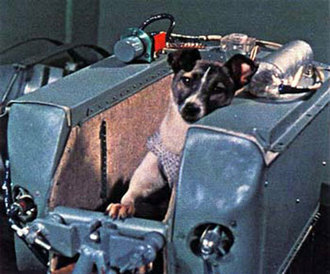 50 Years Ago Today. . . .
Fifty years ago today was the launch of the Sputnik 2 -- and the subsequent death of Laika, the rocket's only passenger. If you have time to toast the small dog who initiated planet Earth's exploration of space, please raise a glass in her memory.